For those with a family member or loved one suffering from a hoarding disorder it can be difficult to know how to help a hoarder clean up. What is Hoarding? Simply defined, hoarding is the extreme collecting of anything from trash and animals to clothing and toys. It makes no difference what the hoard is made up of, but to be considered true hoarding it has to be large enough that it disrupts the functionality of a home. 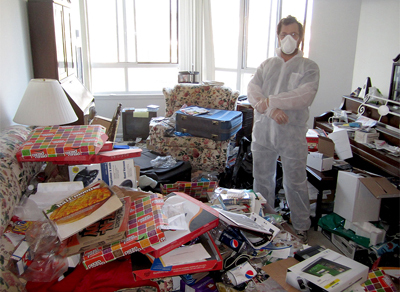 A hoarder’s overwhelming mess and clutter can be made even worse by the odor, dust and mold inside the hoarder’s home. Because the hoarder still has an attachment to the things they own, it is extremely important to approach the hoarding situation with care and compassion. Upon arrival our certified staff of trained technicians will clean, sanitize and deodorize the hoarder’s living space. Using specialized protective gear our hoarder clean up technicians will remove all biohazards including decomposing animals, bodily fluid and other hazardous materials from the home. Decontamination: Cleaning and scrubbing of blood, body parts and fluids. Proper disposal: We will dispose of all biohazards in proper containers and transport them to a proper disposal facility, and we will make every effort to preserve precious personal memorabilia such as photographs or keepsakes.